Pets are fun and sometimes can be clumsy and they can make the carpet cleaning process difficult. They can cause stains on the carpet due to the vomit or any other stuff. Pet vomit can be of various forms as it depends on the intake of the food or the liquid that they take. To make carpet cleaning process easy, remove the vomit on the carpet as soon as possible to clean pet vomit stain. How To Clean Pet Vomit From Carpet? The First and foremost step of the carpet cleaning process is to use a cloth or a paper to pick up the junk on the carpet. 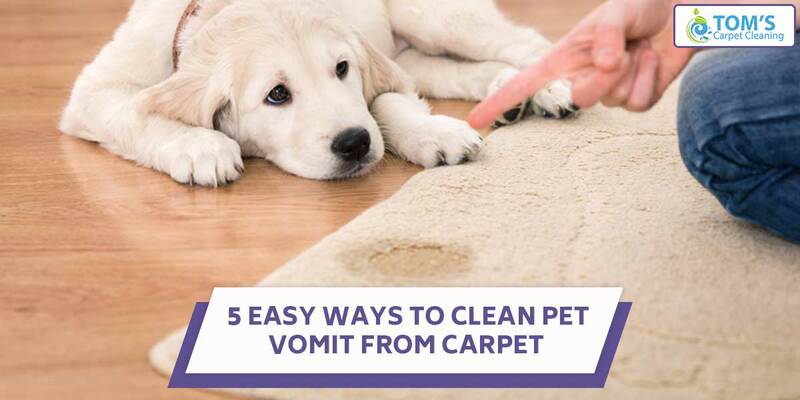 By gently removing it this way you’ll prevent the further seepage of vomit into the carpet. Don’t use the vacuum cleaner to clean the junk from the surface of the carpet. Pour white vinegar or hydroxide solution or alcohol solution on the top of the strain. Take a cloth and damp it with the solution above and press the cloth/towel into the stain. Clean the stain as much as possible until the strain has been removed. Use a little amount of baking soda in a bowl and Pour it over the entire stained area, and let it sit for 15 to 20 minutes. The natural absorbency of the baking soda will soak up the liquid part of the pet vomit stain. The baking soda also ensures that the foul odour due the vomit is removed and deodorises the area. If the discolouration of the carpet still persists after the treatment it can be washed in a washing machine with detergent for smaller rugs and for a large rug, you can use a carpet cleaner to steam clean the stain. If you are too busy to clean the carpet hire a professional. Contact a professional for Carpet Cleaning Melbourne available at affordable prices. The price of carpet cleaning is determined by the way in which your current carpet is. There are several carpet cleaners that provide such services. Technicians will inspect the carpet for stains and treat them with dry cleaning solutions and stain removal products. The main advantage of hiring a professional is they use less water and thereby cause less mess in the house. By hiring the professionals, you can have a mess-free cleaning of carpet, save your time and effort, does not cause the wear and tear of the carpet due to excessive cleaning and many more! In addition to clean pet vomit from the carpet, the hiring of the professionals also ensures the removal of other dirt and also removes the old stains making the carpet look brand new! Call Toms Carpet Cleaning professionals on 1300 068 194 to get their exclusive service Carpet Cleaning Melbourne.